ARKELLS – Juno Award Winners – Good Canadians – Oh Just Eat It! On March 16th, 2019, ARKELLS won the Juno award for GROUP OF THE YEAR. That wasn’t really a surprise. ARKELLS have been steadily climbing in music sales and concert ticket sales over the years. They’ve built a loyal and loving fan base. With another band this gesture may seem contrived, but those who know ARKELLS know that this is right in character. Even Kerman taking over the room and saying “let him speak!” is completely in character. ARKELLS first came together in 2006. They named the band after their rehearsal space on Arkell Street in Hamilton, ON. RALLY CRY, is ARKELLS’ fifth studio album. They just completed their Canada/U.S. tour to promote the release of the album. ARKELLS, with members Max Kerman (vocals, keys), Anthony Carone (keyboardist, arranger), Mike DeAngelis (Guitar), Nick Dika, (bass), Tim Oxford (drums), Dan Griffin (Guitar), have now won five Juno Awards. This year Mike DeAngelis, who has been designing the bands merch, posters and album art since the band’s conception, was nominated for a Juno for album design. This year, the video for the band’s song “People’s Champ”, has been nominated for the Prism Prize, a juried award administered by the Association for Music and Innovative Arts. ARKELLS are a philanthropic band. They partnered again for this last tour with PLUS 1. 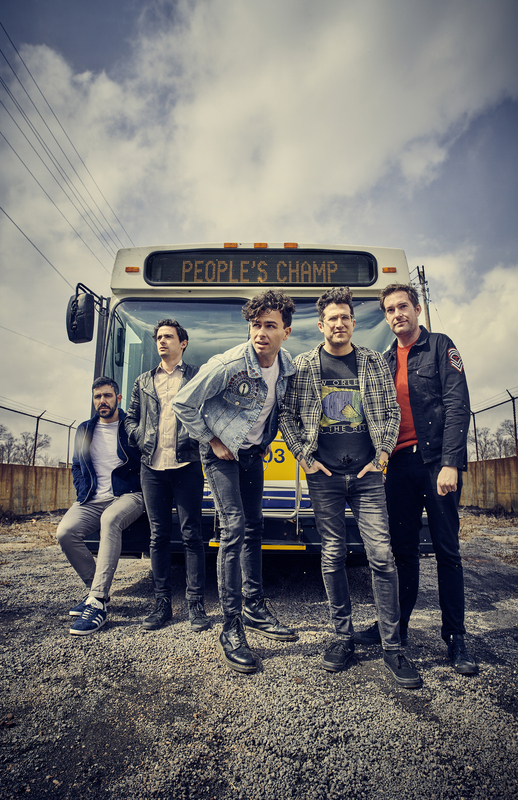 Through PLUS 1, ARKELLS donate $1 from each ticket sold to the Canadian Council for Refugees. In recent news, “Relentless”, a single from the latest album, will be used to fight Ontario’s new autism treatment program. ARKELLS call their songs “battle cry”. When asked permission by a group of citizen lobbyists to use the song in this political context, they didn’t hesitate. When in Calgary during the Canadian leg of their North American tour, ARKELLS stopped in to visit the kids at the Calgary Arts Academy who were the 2018 winners of the MusiCounts Passion Prize for their YouTube cover of Arkells’ “People’s Champ” for the Canadian Music Class Challenge put on by MusiCounts and CBC Music. Apparently, a couple in Calgary got engaged during their VIP visit with the band. ARKELLS have always been very engaged with their audience, both online and on stage. In each Canadian town, Kerman reminisces with the audience about the small venues they’ve played at there. I saw them in Winnipeg. In Winnipeg, they’ve played the Royal Albert Arms, Pyramid Cabaret, Garrick Centre and the Centennial Concert Hall. They performed as the headliners for the first time in their careers at Bell MTS Centre. They took about 3/4 of the stadium. Ticket sales were soft, but once they got started, the building felt like it was 3 times as full as it was. Kerman is excellent at working the room and waking up the crowd. Everyone was singing along to the ARKELLS’ famous tunes and dancing. The band puts on an engaging and energetic show. No one left the show unsatisfied. Their set list includes about 22 songs including a couple of covers like “Dancing Queen” by ABBA. The band is accompanied by Northern Soul Horns and deploy pyro and confetti as their songs climax with the entire audience as backup singers. During the Winnipeg show, Kerman went out into the crowd. The whole show he had been saying ‘It’s Monday, but for us it’s Saturday night!’. He went into the crowd to hand out permission slips for skipping work the next day; signing his name on each. As he was up in the stands, a father came forward with his little girl in his arms. Kerman put the mic up to her and she said “It’s my birthday”. Her father, Scott, told me he’s a single father. He managed to get free tickets to the show. Outside the venue, people were stopping Scott and Scotlynn on the street, waving from cars, and wishing her happy birthday. Both father and daughter were beaming. Like I said in the beginning of the article, it’s no surprise that ARKELLS have won another Juno and it’s no surprise that they graciously gave up the mic to allow an important Canadian message to be heard. The ARKELLS are good Canadians. They’re one of us.